UPDATE (Jan. 12, 2017, 4 p.m.): Tobin Phillips pleaded not guilty and will be back in court on January 26. 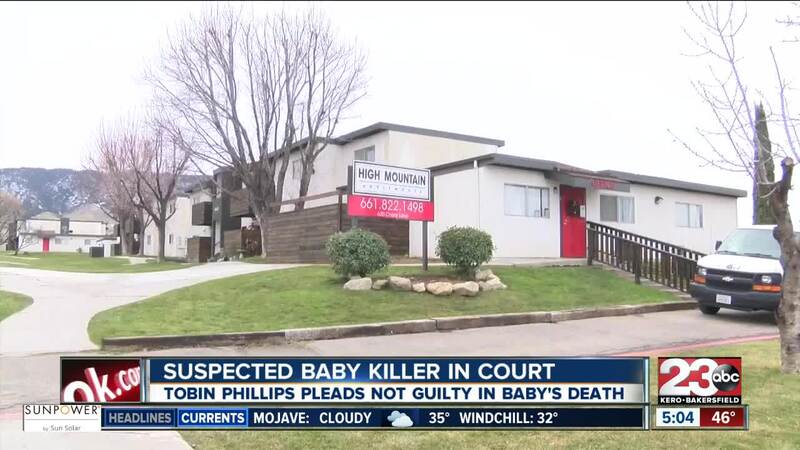 20-year-old Tobin Phillips will be in court today, Thursday, January 12, 2017, for his involvement in the murder of his girlfriend's eight-month-old baby boy. On January 2, 2017 , Kern County Sheriff's deputies were called to Cherry Lane in Tehachapi, just east of Tucker Road, for a homicide investigation. When they arrived, they found the baby boy dead inside. Phillips told investigators that he tried to get the baby to stop crying by covering his face with a pillow. Court documents state that Phillips even sat on the pillow before he swung the boy back and forth, causing him to hit his head on a metal futon. Tobin is being charged with first-degree murder and assault of a child under 8, resulting in death. Both charges are felonies.